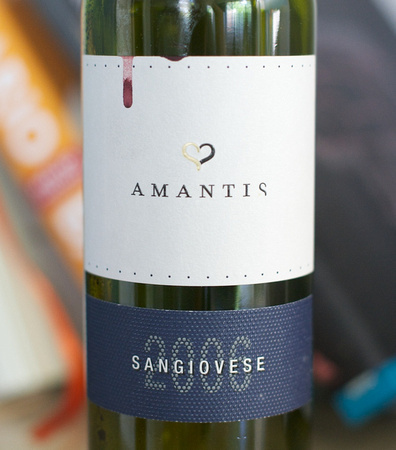 For Friday night pizza night I turned to Italy and Amantis Sangiovese 2006 $22. This is a very interesting wine. When I first opened the bottle it was incredibly floral with a strong Jasmine smell. As it opened up the floral component almost completely disappeared. If you have never done it I would highly recommend tracking how a wine changes over the course of an hour or more by at least smelling it, if not tasting as well over time. After the pizzas were done the floral smell was replaced by what I can only think of cherry cough drops and milk chocolate with a hint of cinnamon. The palate is incredibly similar with the cherry cough drops, chocolate, and cinnamon leading into what tastes and feels like black tea. A very interesting wine with a bit of age that definitely mellows it.